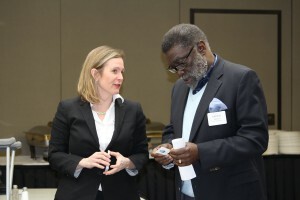 This February at the general meeting of Pittsburgh Presbytery, there was a luncheon and talk regarding the Freedom Rising Pilot Project that has been in the works for over a year. 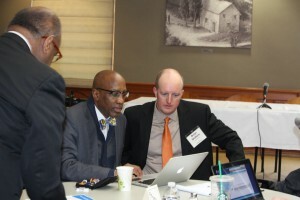 J. Herbert Nelson, the stated clerk for the Presbyterian Church (U.S.A.), chats with Brian Wallace of the Pittsburgh Presbytery during a Freedom Rising luncheon in February. In February of 2016, Pittsburgh Presbytery first introduced the initiative at its meeting in the form of an overture to go to the 222nd General Assembly of the Presbyterian Church (U.S.A.) in Portland, OR. The overture passed from the committee to the full assembly with no problems and, once voted upon by all those in attendance, began its journey to becoming the movement that it is now. In the months since the overture passed at GA 222, the movement has spread from the Pittsburgh Presbytery to involving those of Baltimore, MD; Charlotte, NC; Western Reserve (Cleveland, OH) and New York, NY. This sentiment was continued as the various constituents of the movement gave brief updates. Pittsburgh Presbytery has been focusing efforts on a cohort-based mentoring program for children in elementary schools, very similarly to the initiative in New York City. Selma Jackson, NYC’s representative at the luncheon, spoke of how it is so important to focus on black male children because they are so negatively impacted by the stigmas in place. “It lifts everybody’s boat if we all participate and create a new dynamic,” Jackson said. Johnnie Monroe, the moderator for the Synod of the Trinity and a member of Pittsburgh Presbytery, talks to Ellie Johns-Kelley of the Presbyterian Foundation at the Freedom Rising luncheon in Pittsburgh. The Presbyteries of the Western Reserve (Cleveland) and Charlotte both are focused on encouraging dialogue in their communities as well as their presbyteries. The PC(USA) on the national level has also been closely involved with the Freedom Rising Initiative. Sterling Morse, coordinator for the Intercultural Ministries for the PC(USA), feels the church needs to play an integral role in this issue. This became clear when another member of the movement, a representative from the French Evangelical Church of New York, spoke of how well both church and secular organizations can work together by focusing on the problem at hand and how it needs to be addressed, and recognizing why it is that they all are involved in it. To get involved in the Freedom Rising Initiative, visit the Presbyterian Foundation website here to give an electronic gift that will be divided among the five pilot cities or mail a check directly to the Pittsburgh Presbytery. If you would like to get involved using your talents, contact the nearest presbytery that is involved and see what you can do to help.